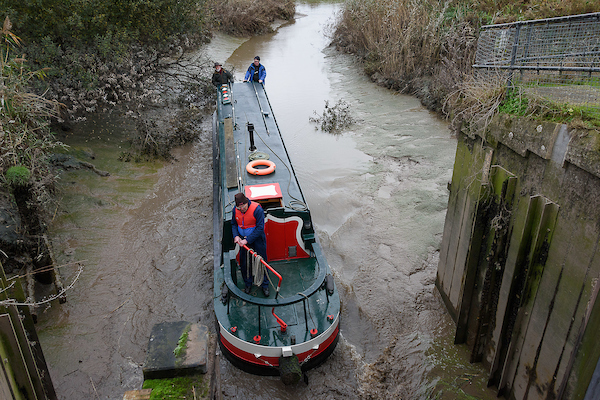 John Revell reverses Olive Emily into and through the Salters Lode sluice gate to join the Old Bedford river. Following on from John Revell’s previous blog about the efforts to restore the Old Bedford river to navigation. John follows up with his latest thoughts. Photography by Mike Daines. 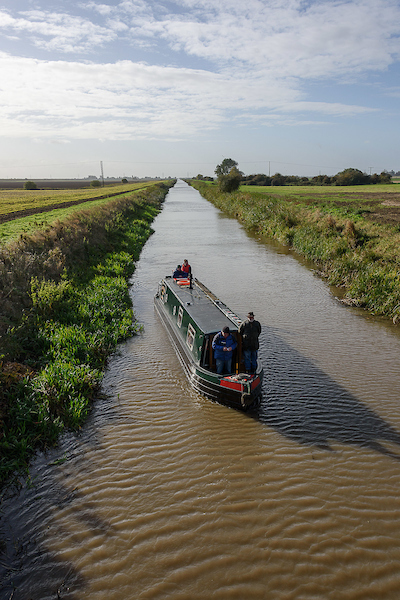 In November 2016 I took my narrowboat Olive Emily, based at Fox’s Marina in March, into the Old Bedford River via the tidal river Great Ouse at Salter’s Lode. This is not as simple as it sounds. It has to be done “on the level” and the Old Bedford and the narrow tidal channel which leads to it are in poor condition. As a result few boats have been willing or able to do this in recent years. This year I emailed the Environment Agency (EA) well in advance on the 7th October advising them that I proposed to navigate the Old Bedford during the period 3 November to 5 November. I further explained that I would aim to cruise all the way to Welches Dam lock and I asked for confirmation that the Welney Guillotine Gate, through which we would have to pass, would be left in the raised (navigable) position. I never received a reply from EA. I successfully entered the Old Bedford at 7.45 am on Saturday November 5. 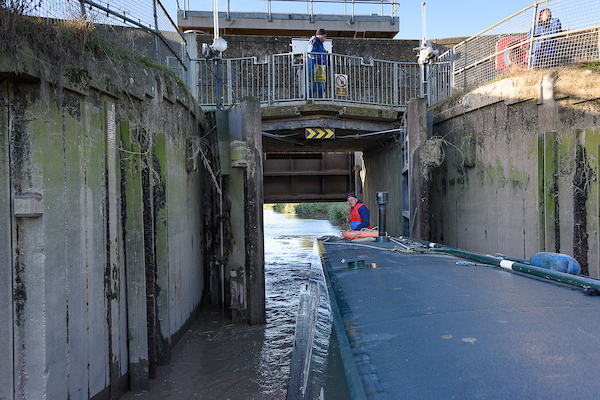 This was not straightforward (see photos) but the Middle Level Lock keeper and an EA staff member were very helpful and together with a volunteer crew of David Venn, Chairman of IWA Peterborough branch, Chris Howes, Ivan Cane and Mike Daines, I headed off towards Welches Dam. A view rarely seen over the last ten year!. 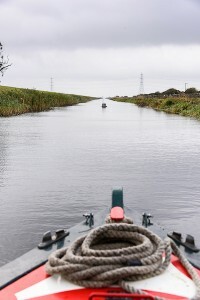 Looking over the prow of a narrowboat navigating the Old Bedford river towards Welney and Welches Dam lock. As we approached the power lines the river took on a glazed and milky look and we became engulfed in a mass of cott weed with the water level dropping to a silted muddy depth of just one foot. Heading towards Welney on the Old Bedford river in November 2016. NB Olive Emily is about to run into a mass of cott weed and an undredged length of the river that runs beneath the power cables three miles from Salters Lode. This is evident from the uncovered section of bank underneath the pylons and the continuation of dredging further along towards Welney and Welched Dam lock. We had failed in our objective to reach Welches Dam lock which was stanked off by the EA in 2006. 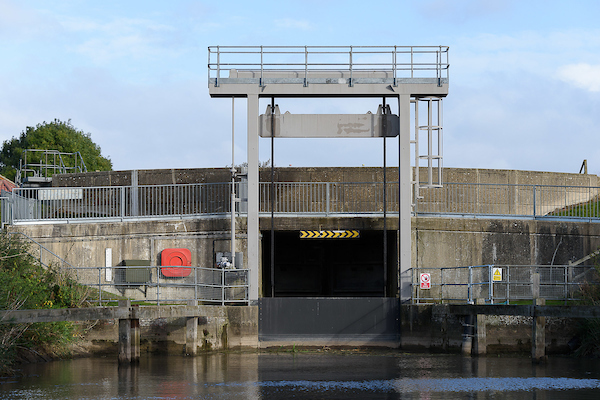 This lock has remained closed and impassable for 10 years despite the efforts of the IWA locally and nationally, the East Anglian Waterways Association, Fox Boats and the Project Hereward team. 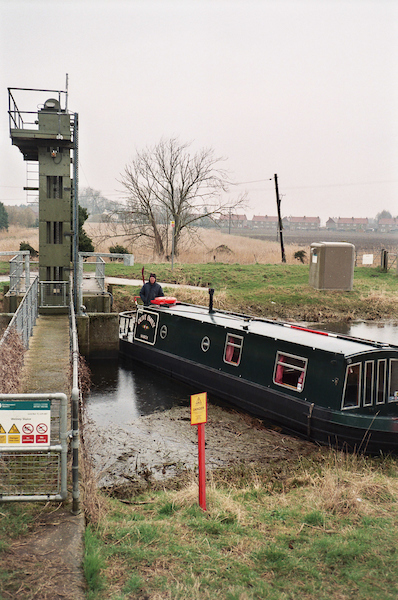 The “temporary” piling which was installed by the EA in 2006 covers most of the entrance to the lock so it is very effective at stopping boats but rather less effective at stopping leaks which was claimed to be the reason for the piling in the first place. Two developments occurred between my email to the EA on 7 October and my passage on 5 November. 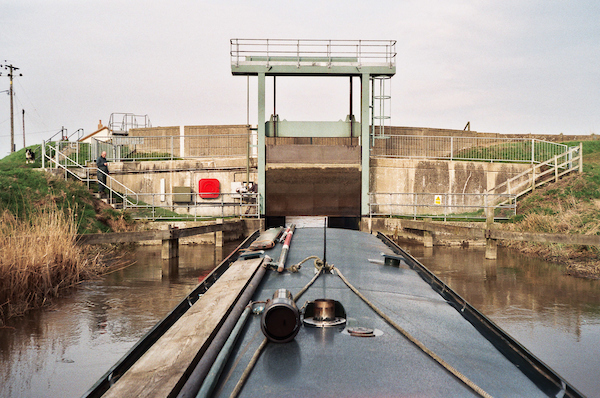 Firstly, I found out late on 3 November that the Welney guillotine gate was in the down (unnavigable) position. This came as a surprise as I had been assured that it would remain up (navigable) position unless there was a change in river conditions. Olive Emily’s volunteer crew man the poles to extract her from the silt. 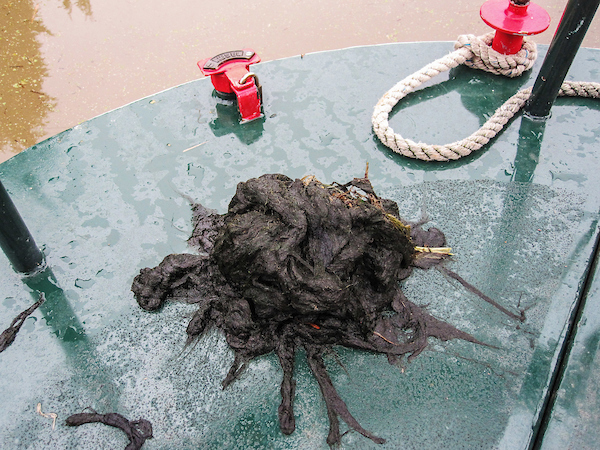 Whatever the reason, this had made the tidal passage into the Old Bedford at Salters Lode unnecessarily difficult and muddy. It meant that that the depth of water in the Old Bedford was shallow throughout. It also meant that an attempt to enter the Old Bedford the previous day (November 4) had been unsuccessful and had had to be abandoned. 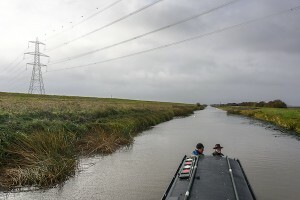 The general lack of depth became an insuperable problem when I had reached the stretch of very shallow un-dredged water, deep mud and glutinous cott weed close to the overhead electrical lines. 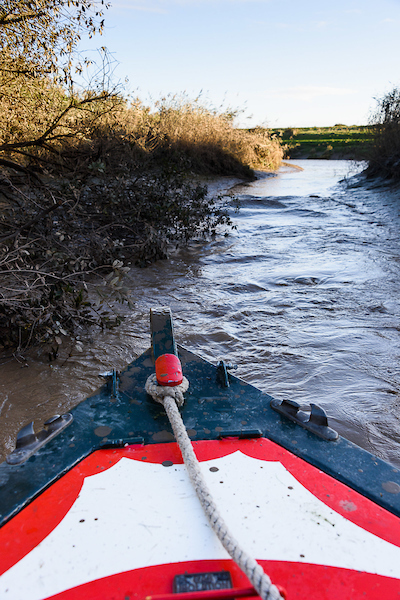 Everyone knows that special precautions must be taken when working near them but this situation arises routinely on other rivers and canals and is easily overcome. Indeed the same overhead lines cross the nearby navigable New Bedford river, Well Creek at Nordelph and the Great Ouse at Littleport. The Canal and River Trust (CRT) has built on the long experience of British Waterways in managing rivers so that they remain navigable most of the time but are closed when flood conditions require. Just think of the Rivers Soar, Trent, Severn, Avon, Weaver or the river sections of the Trent and Mersey or the Caldon or the Calder and Hebble to name just a few. 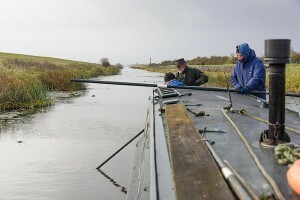 Skipper John Revell negotiates NB Olive Emily back out through the tidal doors "on the level" from the Old Bedford river. Olive Emily approaching the Old Bedford sluice, March, 2010. Note the depth of water! Olive Emily returns along the narrow tidal channel to the tidal River Great Ouse prior to locking back into the calm waters of the Middle Level at the end of the trip.